9 posts categorized "What I Just Read"
Asterios Polyp is one of the most remarkable graphic novels I’ve read. David Mazzuchelli takes the form to new heights, reinventing its language as the very best do. He also plumbs human, narrative, emotional depths that even fewer comics can touch. And to top it all off, he delivers all that in one of the most pleasurable, accessible reads of all. Formally as daring and brilliant as Chris Ware, Mazzuchelli’s Asterios Polyp turns art and design idioms into a unique new comics syntaxe. Every single character speaks in a distinct typeface (which could have been a disastrous decision in lesser hands.) In different modes, characters appear more figurative or more abstract, or as architectural schematics. Colors become a code, expressing balances of power and the inner nature of a character. And there’s more, all of which dazzles by its thoughtfulness, its care, and its intelligence. Far from a purely cerebral pleasure, Asterios Polyp also manages to take its reader by the hand and lead the way to things mightily poignant. There is a story thread between Asterios and Hana, told in action, dialog and above all color, that is intense, real, moving. An unforgettable Orpheus and Eurydice sequence is overwhelming. As with great characters who live on forever in novels or film or anywhere Asterios Polyp’s transformation feels both startling and inevitable. And it’s so often hilarious—all of it bathes in Mazzuchelli’s rich humor, the humor of an experienced man, a mature author, a true literary and artistic mountain goat, at his ease scaling, hopping around and delighting himself at these great heights. Though most characters are at times pathetic or laughable, Mazzuchelli peers into human nature with kindness and endearment. It’s also a beautiful object, and here Pantheon does what it shines at. The silky blueish-white paper stock is a perfect setting for the clever CMYK magic Pantone spot color magic that unfolds in Asterios Polyp. I was told the rare paper is only produced by one mill in Japan—a nice selling point that underscores the loving attention this book exudes in all of its attributes. Editing First Second authors, I sometimes worry about the pressures the publishing world (contracts, deadlines, release dates) can exert on the creative life. We live in the age of the forced fruit. Some books, it’s true, only need a short gestation period and labor. Others need longer. Alison Bechdel took seven years to make Fun Home. Art Spiegelman gave his total Maus thirteen years. Asterios Polyp feels like it’s had the time to cook, to grow in layers, to take on a life of its own, one that conceivably escapes even its author’s full grasp—or at least has had a chance to surprise him, and revealed itself along the way. It’s been ten years waiting for David Mazzuchelli’s new work. It would have been worth waiting another ten for this. What puts a graphic novel into every reading household? What delivers it to the ages, to outlast its creator, its generation? It isn’t some clever new premise, or some new creature, some bizarre special effect, or some new titillating shock—the gimmicks all too many new works (in every medium) reach for in the absence of anything else. What lets a comic join the timeless best of the human heritage lies somewhere in an artist’s ability to think deeply, to feel deeply, and to have the skill to give that a fitting portrayal. Asterios Polyp is one of those. It’s excellent and magnificent. Took this on the subway last night, and missed my station by two stops. Mark Siegel of First Second Books heartily endorses Cul De Sac while at the same time totally revealing he doesn't read this blog or at the very least doesn't value any of the opinions expressed here! Thanks for nothing, Siegel! Actually, I'm kidding, and am glad that Siegel enjoyed the first Cul De Sac book as much as so many of you have told me you have. It's a really, really strong strip. OK, so I see that I missed an extensive interview of Thompson, back in January... I had an excuse: I was in Angoulême for the Comics Festival at the time. Perhaps the most discreet publishing job ever! Even if you're holding this book in your hands, you might not be entirely sure it was created by none other than Chris Oliveros. Bravo, Chris! A treat from a very bright talent, Lilli Carré. See for yourself. And from Monsieur Jordan Crane, a very impressive piece. I especially enjoyed the first story, BELOW THE SHADE OF NIGHT. But right now it's crazy for me to even think of blogging. We're wrapping up the Spring '07 books as we speak -- and the deadline to send them to the printer is TODAY. 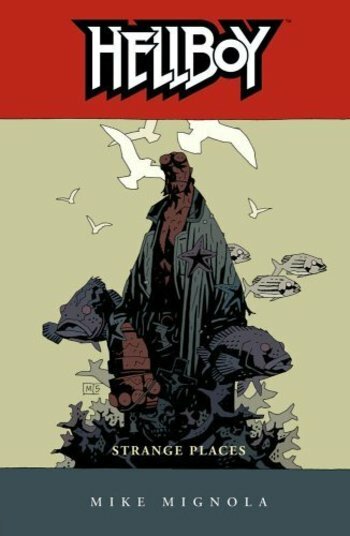 Mike Mignola is a poet. His HELLBOY short stories, since The Chained Coffin have long broken out of the limits of the gothic creature genre, and for their sheer graphic power, the eloquence and literary resonance of his writing, the intelligence, the weird humor and melancholy that pervades them, these short tales escape into the lyrical. I think history will be kind to Mignola's strange little gems, in which his renegade devil with broken-off horns wanders through the folktales of Ireland, Russia, Norway, Japan, Africa, and elsewhere. This new one STRANGE PLACES, the first in three years, is outstanding. The short storyThe Third Wish alone makes this a must-have. And Dark Horse put together another nice package of this one, with a smart introduction and Mignola's own process notes before each tale. I've just read and re-read Sammy Harkham's CRICKET, volume 1. It's sheer pleasure and Drawn & Quarterly continue to shine with such offerings. Visually, it has Harkham's unique and charismatic stamp; what seems at first like an arresting graphic experiment opens out to a brilliant story beginning. What promise. 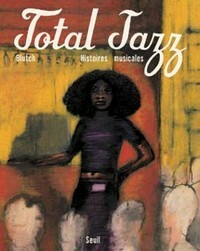 Over at Tom Spurgeon's COMICS REPORTER, the excellent Bart Beatty reviews Blutch's TOTAL JAZZ. "So, what happens when one of the greatest living cartoonists (and if you don't think Blutch fits this bill you really, really need to read more Blutch) takes on the work of some of the greatest musicians in the history of jazz? " TOP SHELF continues to be a class act among indie comics publishers. Editor Chris Staros deserves credit for promoting and discovering some great talents these past years. If you aren't familiar with the offerings of Top Shelf Books, here's your chance for a shopping spree with plenty of good stuff to choose from: they're having a big special sale online. 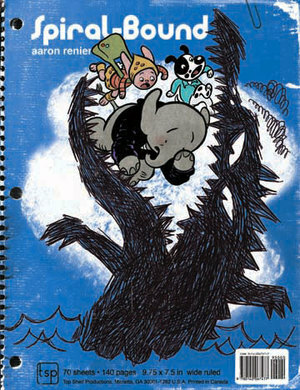 ...the delightful SPIRAL BOUND, by Aaron Renier.